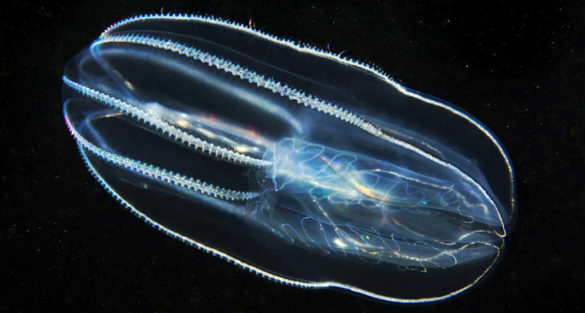 This key innovation, which made possible the rich diversity of life on earth, is found in the most ancient of currently living animals — the ctenophore, Vanderbilt University Medical Center scientists reported Tuesday in the online journal eLife. Ctenophores, commonly called comb jellies, are marine invertebrates known for their translucent, globe-like bodies that refract light into dazzling rainbow-like colors. They have one thing in common with all animals — rope-like collagen IV molecules that assemble into scaffolds outside of the cell. These “smart” scaffolds are the fundamental architectural unit of the basement membrane, which, in turn, connects cells, provides strength to tissues and transmits information that influences how cells behave. Understanding how collagen IV scaffolds bridged the transition from unicellular to multicellular animal life sheds light on diseases as diverse as kidney failure and cancer, said senior author Billy Hudson, Ph.D., the Elliott V. Newman Professor of Medicine at Vanderbilt University School of Medicine. The search for the evolutionary beginning of collagen IV scaffolds began in the Hudson lab in 2009 with help from high school students and college undergraduates from disadvantaged backgrounds who participated in the Aspirnaut summer research program. The team analyzed tissues from creatures as ancient as sponges and comb jellies. “We found that among all the collagens that make up the human body, collagen IV was the key innovation enabling single-celled organisms to evolve into multicellular animals,” said first author Aaron Fidler, a graduate student mentored by Hudson. Fidler, who will defend his Ph.D. dissertation this summer, described collagen IV as a kind of molecular “glue” that ultimately enabled the formation of tissues and organs. Hudson, who directs the Vanderbilt Center for Matrix Biology, has been studying the role of collagen IV in health and disease since the early 1970s. His group discovered two of the six “ropes,” called alpha chains, that in humans assemble in different combinations into the three-stranded, triple helical collagen IV molecules, forming smart scaffolds. These scaffolds play a key role in the pathology of kidney diseases including Goodpasture autoimmune disease and Alport syndrome. In 2009 Hudson and his colleagues discovered that the triple helical scaffold is held together by a sulfilimine bond — a sulfur atom bound to a nitrogen atom — something that had never before been seen in nature. That set off for Hudson another string of questions. Where else can this bond be found? How far back in evolution does it go? To find out, he asked Fidler to lead Aspirnauts students on what they dubbed a “biochemical expedition through the Animal Kingdom.” Julie Hudson, M.D., executive director and co-founder of the Aspirnaut Initiative, selected the students for the expedition. Over four successive summers, 80-odd Aspirnauts students tracked the sulfilimine bond through more than 30 animal species as far back in evolutionary time as jellyfish and sponges. In 2013, their findings were published in the Proceedings of the National Academy of Sciences (PNAS). The authors included five graduate students, 30 college undergraduates, 42 high school students and six middle school students. The final step, tracing the evolution of collagen IV back to the ctenophore, the most ancient of animals, was reported today. While the expedition is over, there is much more to learn. During the past few years, the Hudson lab discovered that the enzyme peroxidasin — aided by a bromine co-factor — catalyzes formation of the sulfilimine bond, and that chloride, an essential electrolyte, signals the assembly of the collagen IV scaffolds. Chloride’s role in establishing a “microenvironment” outside the cell thus suggests a potential way to treat or prevent conditions like diabetic kidney disease that affect the basement membrane, Hudson said. Other co-authors of the eLife paper were Antonis Rokas, Ph.D., Cornelius Vanderbilt Professor of Biological Sciences; Jay Jerome, Ph.D., Kyle Brown, Ph.D., Sergei Chetyrkin, Ph.D., Carl Darris, Ph.D., Vadim Pedchenko, Ph.D., and Sergey Budko, Ph.D.